Blue Marble interacts with each child as a unique and talented individual. Everyone has challenges and strengths; each program, whether remedial, accelerated or tutoring, is individually crafted for your child. Our responsive approach to working with children and teenagers empowers them to be self-advocates by teaching them to understand and embrace their learning styles. 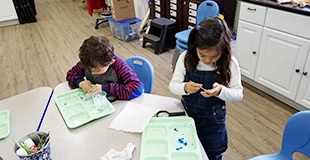 The mission of Blue Marble is to provide highly individualized instruction, through educational therapy or tutoring, so that each child becomes a confident, successful and self-aware learner. Blue Marble’s instruction emphasizes staying in the “zone”. We look at academic goals, learning style, executive function skills, and kinesthetic needs. This determines the amount of time spent on each subject or skill. Educational Therapy is targeted remediation done by a highly trained professional who combines educational and therapeutic approaches to help children be successful academically, organizationally and emotionally. Best fit research-based methodologies are used for each student. Blue Marble will suggest what types of assessment would best benefit each student. This could either be a hands-on or diagnostic assessment done in the first session, or a full academic evaluation. There is on-going informal monitoring of students to see where they are in terms of challenge and success.